With Barcelona regaining their crown, clubs like Valencia returning to the summit, and a record 5 teams due to participate in next season’s Champions League, the competitiveness and quality of football in the Spanish league was undoubtedly at its height. 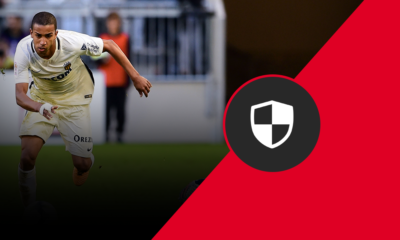 Though the Catalan giants dominate much of our awards, there are a few underdogs who get their claim to fame and some familiar faces get their undue recognition from the readers of this website as they vote for the best in Spain’s top division. 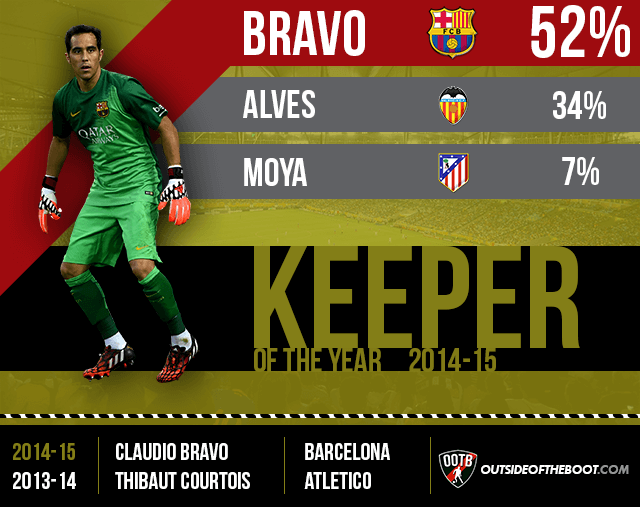 It’s been a strange sort of year for Barcelona in the keeper department. They’ve had two brilliant keepers, and neither has really underperformed at all. Ter Stegen has been solid between the sticks in the cups, and Bravo has been fantastic in the league, and deserved this award. The long run of clean sheets at the start of the season definitely helped. The Chilean isn’t as good as his competitor with respect to keeping technique, but he’s pretty good on the ball, and that is a very valuable skill. Valencia have had a great season, and finally secured their return to Champions League football. Los Che have seen spirited performances from their entire squad, thanks to an inspirational manager. 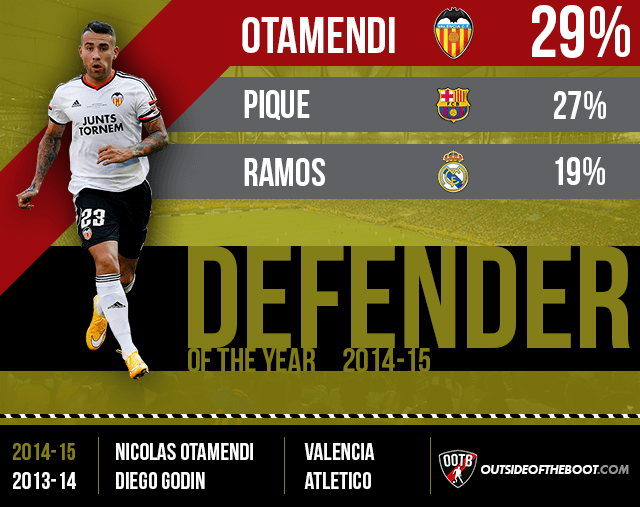 Nicolas Otamendi has been one of the top performers for the team, setting the benchmark in defence as Valencia stayed consistent enough this campaign to finish 4th. Pique has finished a close second, and rightly so. 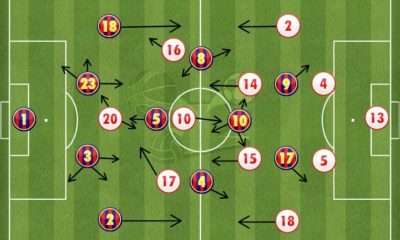 Barcelona’s Achilles’ Heel has been defence, but it hasn’t really been exposed as the big defender has been focused throughout the season, and kept things tight at the back, allowing his forwards to call the shots. Coming into a star studded Real team to replace the much loved Angel Di Maria, many branded the purchase of James a purely commercial one. Cash flow aside, the Colombian has been great for Real on the pitch too. Having the likes of Ronaldo around him has helped his game immensely. His creativity is there for all to see and benefit from, and of course, the wonder strikes are much appreciated. 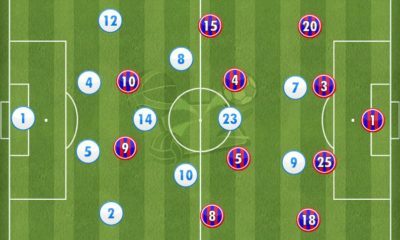 He’s also put in good shifts off the ball to help cover for the lack of a real defensive midfielder, making him brutally effective as a No. 10. 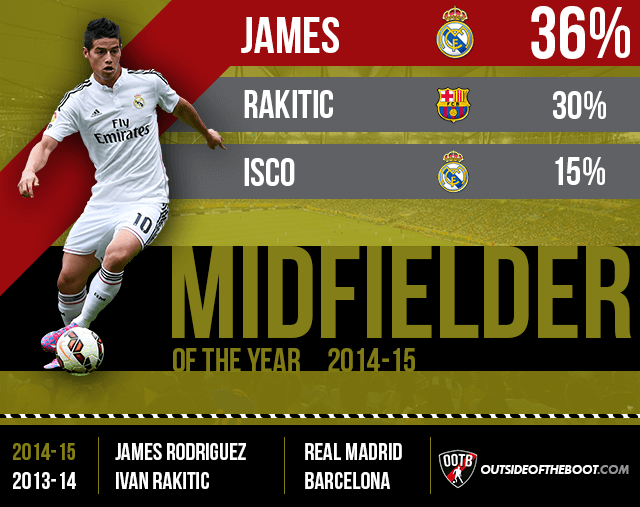 Rakitic and Isco are also two high quality performers. Rakitic has done a swell job of being the supporting player to the forwards, carrying on from his last season at Sevilla. Isco has been the utility man in midfield, even filling in at the base of the midfield in the absence of Luka Modric. He’s definitely earned his spot in the top 3, being the ultimate team man. 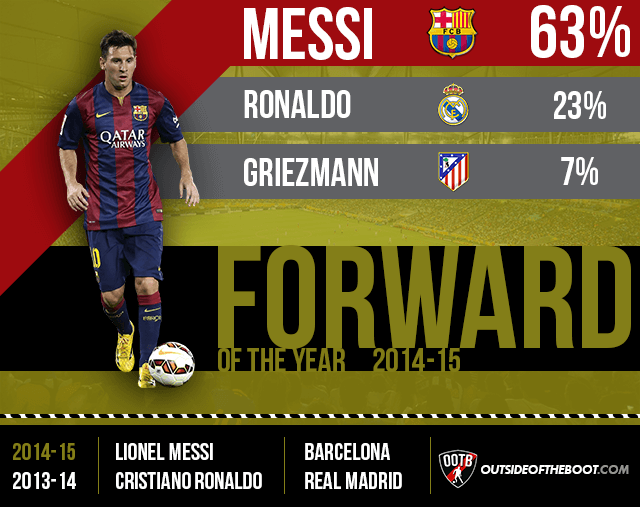 The Best Forward category had to have the 2 familiar names, and on this occasion, Messi comes out on top. He endured an indifferent first half of the season, with transfer rumours surfacing amidst an alleged rift with Enrique, but Leo has turned it on in the second half of the season, and been unplayable at times. Goals, assists, vision, the man has it all, and has shown it again. This is not to say that Ronaldo has had a bad season. 50 goals seems normal now, but the fact that it does speaks volumes. Griezmann has been selected as the best of the rest, and impressive achievement, because he’s thrived in a side that doesn’t necessarily play his type of football. Simeone was the undisputed winner here last season, and it seems that winning the league will win you this award too, as Enrique is our winner here. The former player is on his way to replicating, if not beating Guardiola’s debut season, having beaten the man himself in the Champion’s league semi final. 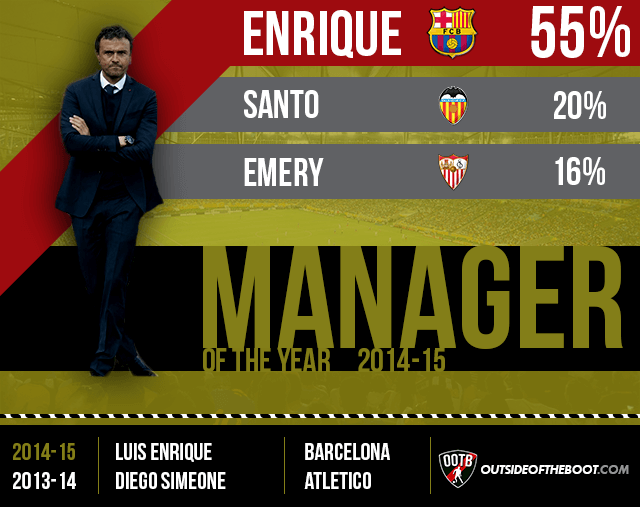 Esprito Santo has again beaten Emery narrowly, but both managers deserve the highest accolades. Football lovers should look forward to seeing them in the Champions League next season, especially Emery, who has now won the Europa league twice in a row despite losing his star player and taking over at a Sevilla that were struggling far away from this limelight. Following in the footsteps of Jordi Alba, Juan Bernat, and Jeremy Mathieu, Jose Gaya is the latest sensational left back to arrive at the Mestalla. 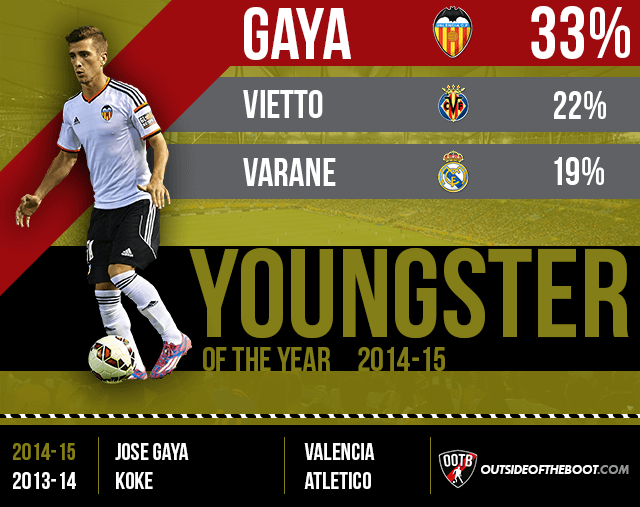 Gaya has been consistently brilliant, and his play going forward has been top drawer. With pace and skill, he’s a great asset for the team, and a deserving winner here. Following him closely are Vietto and Varane. Vietto has been Villareal’s star turn, and continued the trend of terrific young Argentine strikers. Varane is now an established name at Real Madrid, and that speaks volumes of his ability and temperament. No prizes for guessing who the top 2 in this category are, but very encouragingly, third place has Jose Gaya.The youngster seems to have made quite the impression on our alert readership, and that only strengthens our belief in his potential. There may be a large percentage difference between 1 and 2, but dont let it fool you into believing that one is that much better than the other. Messi has had a fantastic second half of the season, leading Barcelona to titles, while Ronaldo was the leader in the first. 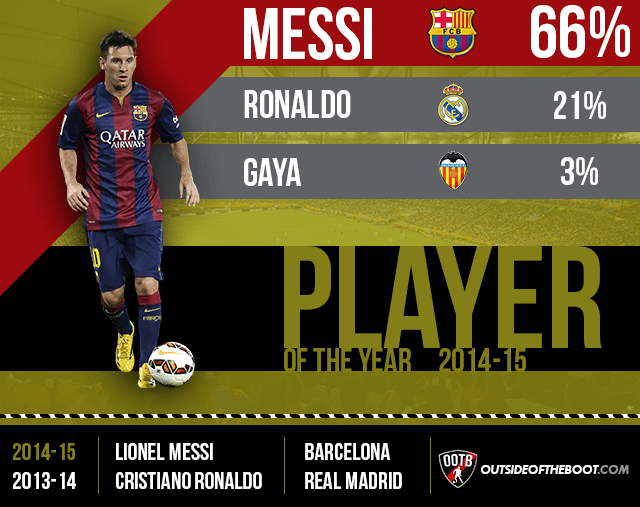 With Messi regaining his mojo, it should be an interesting battle next season, again.